Council Members questioned the developers on the project’s affordability and use of union labor. 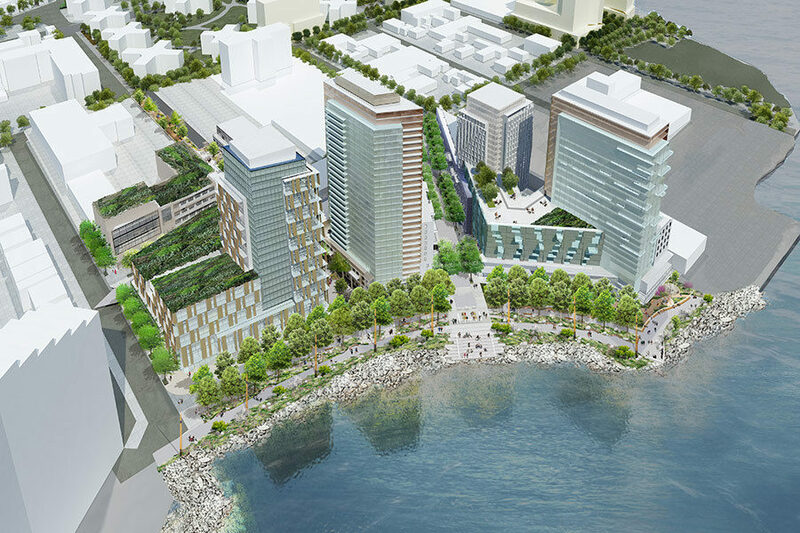 On October 20, 2014 the City Council Subcommittee on Zoning and Franchises held a public hearing on the proposed Astoria Cove development project. The project, which would create a new mixed-use development of 1,700 apartments, commercial space, a school, a supermarket, and parks, was approved by the City Planning Commission over opposition by both Queens Community Board 1 and Queens Borough President Melinda Katz. A presentation by the project’s lead architect Jay Valgora of Studio V followed. Mr. Valgora testified that the developers, led by Alma Realty, had worked with the community for four years in developing the project. The presentation included short video testimonials from NYCHA residents praising the planned co-op supermarket, shops, school, and other amenities. Project counsel Howard Weiss testified about the nature of the requested zoning actions. Mr. Weiss stated the project was a groundbreaking inclusionary housing proposal. “This project is trailblazing. It gives voice to the Mayor’s ten-year housing plan, and it gives voice to a lot of what’s been discussed…on economic opportunity and inclusiveness.” Debra-Ellen Glickstein testified for Alma, stating Astoria Houses is a designated Jobs-Plus site and Alma will work with the community to hire from the Astoria area. Ms. Glickstein also stated Alma’s commitment to explore alternatives to credit scores in evaluating affordable unit applicants, such as past history with rental payments. Council Member Constantinides questioned the panel, focusing on transportation impacts of the project. The Council Member argued strongly for a transportation upgrade, describing overcrowding with area mass transit, and contending that problems will worsen with increased residential units. The Council Member asked if Alma objected to removing a provision in the zoning text allowing reduction of the 80-percent AMI affordable units to 10 percent of the total project in order to offer an extra 20 percent of the project at 165 percent of AMI. Constantinides stated, “You keep saying [you’re] not going to avail [yourselves] of that provision, but ‘cross your heart and hope to die’ is not good enough for me.” Mr. Weiss responded that the economics of building affordable housing without public subsidies required the amendment as written. Other Council Members took issue with Alma on affordability and labor issues. Council Member Antonio Reynoso argued that Alma’s affordable housing position was not something out of the ordinary. “80-20, which is what you’re proposing to do, is something that comes from the old Book of [former Mayor Michael] Bloomberg. It’s something that we’ve thought has failed the communities, especially communities of color or low-income communities throughout the City of New York. It hasn’t worked.” Council Member Reynoso went on to call 80-20 “a joke” and “the old standard”, then held up the Domino factory residential development as a contrast, arguing 27 percent of the site’s total square footage is going to affordable housing with no public subsidy. After the hearing, Council Member Constantinides released a statement anticipating a vote on Astoria Cove to happen sometime in November. Shachar Sharon for the Council Member told CityLand that the Council Member would continue negotiating with the developers on “ample” affordable housing, jobs during and after construction, and expansion of public transportation until the final vote occurs. City Council: Public Hearing, LU 0126-2014, LU 0127-2014, LU 0128-2014, LU 0129-2014, LU 0130-2014, LU 0131-2014 (Oct. 20, 2014).